I first saw ice luminaries gracing the steps of a local church several years ago. these luminaries were pure enchantment. in December freezing temperatures are sometimes followed by a warming spell. until the temperature drops again. can save them to light up your New Year’s Eve. 5-7 five-gallon buckets (can be any shape) with handles. 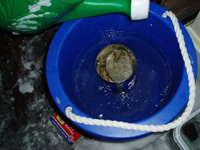 Allow 2-3 days to freeze the buckets twice. or rains you can cover the buckets with a tarp. again up to the rim of the can. Try not to get water into the can with the rocks. Position can in the center again, if needed. down to remove the luminary. 5. Add a candle in the center indentation. with water to get the ice back to its clear state. You can add glitter during either the first or second freezing. there, again, freezing in the center of the luminary. also the publisher of The Heart of New England online magazine.